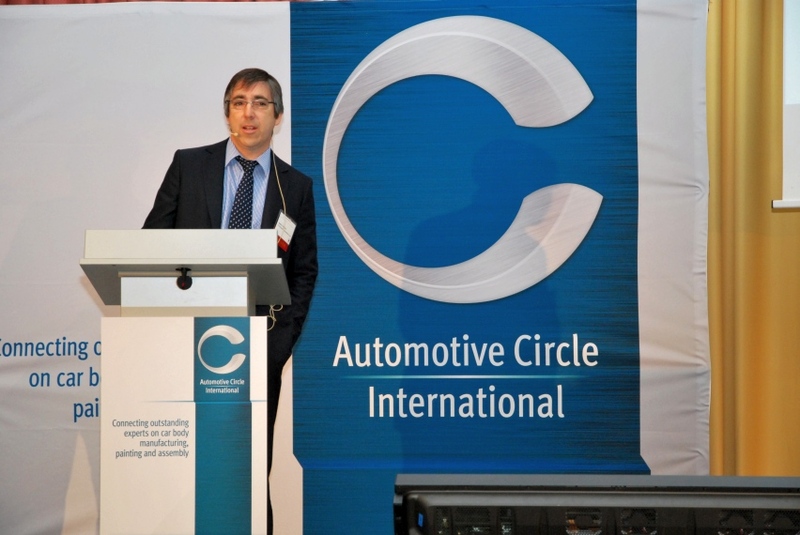 I presented Formtech’s lightweight concept at the recent Future Car Body last week in Bad Neuheim in Germany. An interesting event looking at lightweight concepts of the future. The presentation looked at concepts that were developed during the creation of the Formtech E1 EV research concept vehicle. We approached the development from the ground up looking at the issues surrounding design and manufacturing of composite structures drawing on previous work. Our previous work into the substitution of composites in Formula One was used to drive our thinking in substitution in the automotive industry. 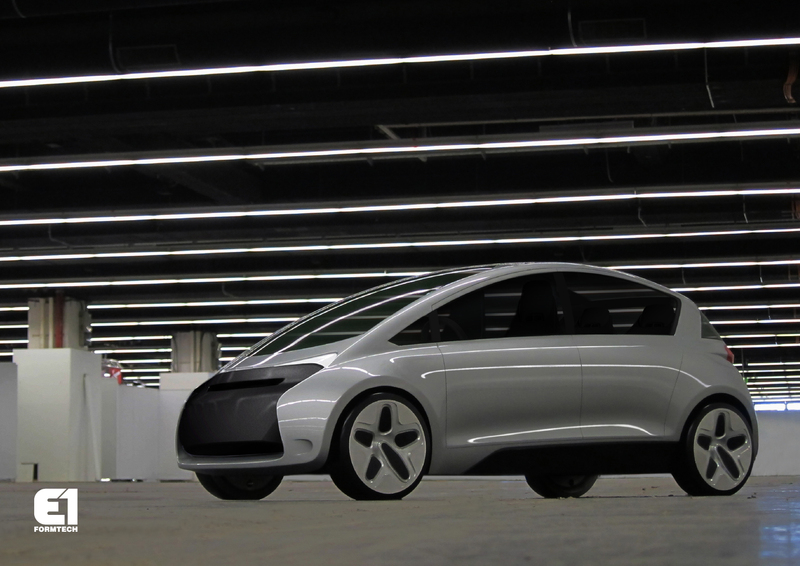 Formtech created a vision of EV when they launched the E1 atFrankfurt’s IAA Motorshow in September. The research study provides the base for a number of concepts in lightweighting technology using composites, high-end materials and machining. 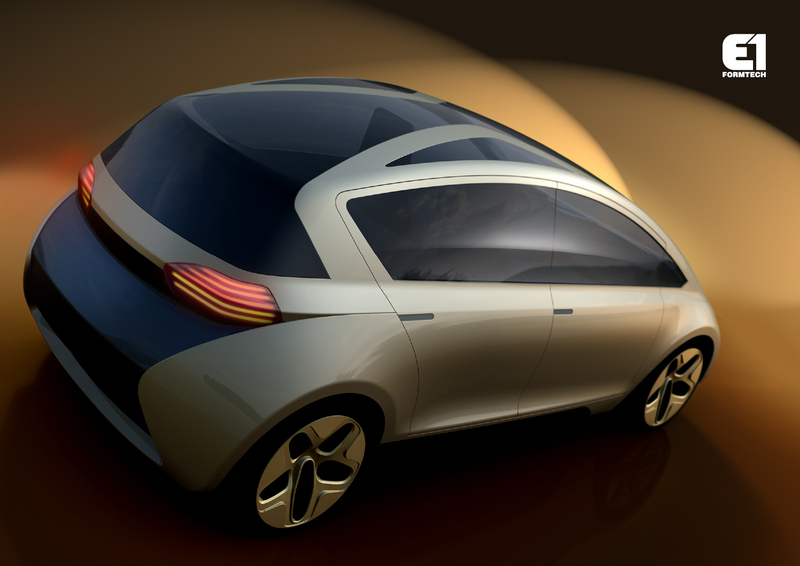 Designers: Satoshi Nakamura, Tomas Beres, and Rafael Gross, were given the brief to develop a number of concepts, “The chosen concept of the E1 came from the idea that a secondary car; where the customer already owns a vehicle, and considering an eco-friendly alternative especially designed for short commute, with the capacity to carry 4 passengers, should be simple and take full advantage of the electric drive train. The limited top speed and range will create a lighter, more efficient vehicle, perfect for a second car. The design features a short overhang at both ends to create maximum capacity within the given wheelbase dimension. The side surface wraps around to the front and rear end, creating a sense of security and strength to the overall form. “, said Nakamura. “The future of EV’s will be based around a number of game changing technologies”, says Mark Preston, ex-F1 designer, “I forsee a change in the way EV’s are perceived with lightweight carbon composites and vehicle dynamics technology such as torque vectoring driving exciting new areas of customer interest. We created the research study in order to create a platform from which Formtech can develop these new technologies and provide solutions for all areas of EV development”. The Formtech E1 forms the basis of further development studies by Formtech into the exciting new area of EV’s. Further studies will be released from Formtech that follow up on the beginnings created with the E1. “Formtech is committed to working towards the future and welcomes discussions with interested companies and investors from the green sector“, says Hilmer. I recently looked into what it would take to own a Nissan Leaf or Chevy Volt/Ampera in a city. I live in the centre of Oxford in the UK and have a membership of a car sharing organisation (Commonwheels) which has a number of cars just nearby. I have done a lot of research into EV’s as part of my involvement in Oxford YASA Motors spinout of Oxford University and an ongoing involvement in composites through Formtech which are quite relevant to weight saving in this sector. Many of the market predictions on EV uptake reference Megacities and the likihood of a change in usage habits driving growth in the market. However, it is quite difficult for me to own an EV. I test drove the Nissan Leaf and much to my surprise, it was, just like a normal car! I think I was mostly surprised that I should be surprised. It had plenty of power off the line, had good build quality, did everything a normal car does and had plenty of extra electronic gadgets that go with EV such as SatNav with predicted ranges and other handy tools for managing range aniexty. The big problem is charging an EV at home when you have a terrace house in the inner city! There are currently no schemes for on street charging in Megacities. Plenty of solutions for people with big houses, garages and off street parking, but not what I would call the areas that may drive EV growth. As always, new innovations come from solving problems and this looks like the next peice of the puzzle that needs to be solved before I could look at EV in the centre of a city. As a follow on to my blog last year where I discussed how randomness drives excitement in F1, the first few races of 2011 certainly provided some interesting racing with KERs, DRS and Pirelli providing a set of variables that the teams have not yet completely mastered. However as I was watching the German GP recently I noticed how the number of different tyre strategies is starting to narrow. It is inevitable that the engineers will eventually remove some of the biggest unknowns in tyre prediction. It was interesting to hear Mark Webber comment that Sebastian had mastered the tyres more quickly than he had. As the teams simulators start to match the reality of the track, drivers like Mark will be able to experiment back at base to coach themselves to make the best use of the tyres. At this point the number of variables will again narrow reducing randomness in strategy. In fact the German GP gave a few more ideas about how the teams might be combining the simulators with drivers and strategy software. The first hint came when Alonso said over the radio that Webbers tyres were starting to drop off and requested an update of the strategy to reflect this change. This shows that the teams models are starting to get quite accurate but they still need an empirical “trigger” or tipping point where the driver helps to recognise a change in the tyres that the engineers can use to re-correlate their models real-time. Once this correlation has been done the strategies can be updated with more accurate information for predicting forward. The cold track temperatures at the German GP seemed to favour the McLarens and they were able to predict the change point of the tyres for last stint to perfection. If the tyre performance curve can be mapped accurately there should not be any benefit from what people are calling the “undercut” as this performance anomaly should be accounted for accurately in any strategy software: leading to no advantage or randomness. Lets see how their models fair in the hotter temperatures in Hungary. The DRS works in combination with the randomness generated by the tyres. Theoretically if the fastest car leads from the front there should be no need for DRS. But, as the tyres provide unpredictable performance variations on each car and with each driver the DRS allows cars to pass each other should one team/driver be lucky enough to find themselves with a different performance envelope in the race in comparison to qualifying. Again, as the tyres become more understood the randomness of the race vs qualifying performances will become less and DRS will become less of an exciting tool. Hopefully the tyres change at a faster rate than the teams can match with their understanding! I had a visit to the Autodromo do Algarve, Portugal, in between Christmas and New Year to say hello to Paulo Pinheiro and the team and see what new things the circuit has introduced since I was here for the A1GP race earlier in 2010. Although I have know the team at the Autodromo since before they started building, I hadn’t had a chance to do a few laps: I got a chance this week. When I first started in motor sports we didn’t have a data logger and being curious I thought the only way to learn more about how the car worked on the track was to write a simulation. Again, at the time, there wasn’t much information about this sort of thing so I had to start from scratch. My correlation was simply asking the driver to remember RPM in different corners and at the end of different straights! The tracks were created from aerial photos (not from Google, I had to buy them!) correlated against track distance stated in the program of the race. I then traced the tracks into AutoCAD and created a DXF driving line. The first simulations were simply straights and corners. Why was this accurate enough for the first development stages? The answer lies in simple integration of a parabola. You can use algebra to solve for the area under the curve, or you can do a number of approximations based on numerical methods. Best to look again at High School maths to prove this one to yourself. F = force: from engine torque, drag from tyres and drag from aerodynamics. There will have to be a simple gearbox included as well. The we simply have some limits on how fast the car can traverse a given corner of radius R. We get that formula from centrifugal acceleration. Hold on, we need to solve for the maximum speed around a given corner. So one last formula, one that tells us what the maximum force can be. Force is proportional to the vertical load and the grip. N = vertical force. This is proportional to the downforce of the vehicle and its mass. Another important thing you will notice here is the ratio between the downforce and the mass: notice particularly that the downforce is non inertial. What I mean is that you get more corner speed for free! This is a very important fact in motor racing. mu = friction coefficient. Probably one of the most complicated variables in our simulation and one that would require a PhD and lots of engineers, or perhaps an entire Formula One team to solve. Mu is proportional to road surface, temperature of the tyres, their compounds, constructions and running pressures, just to name a few. Stick with using 1 to start with! Thats the basic formulae required for writing a simulation, everything else relates to how accurate you can get all of the unknown variables as they effect aerodynamics, tyres etc. Engine (power) is proportional to the acceleration (a) variable, DIRECTLY. After the first race of the Formula One season in Bahrain there was a multitude of articles in the press and on blogs about how F1 was broken. This was quickly followed by an amazing race weekend in Melbourne where the complete opposite was seen. Is F1 broken? Can races be made more exciting? These are the questions that seem to be continually asked. Part of the answer lies in the following statement: increase the likelihood of Random Events. Lets start at the beginning. If you read the previous blog on First Order Performance variables you will see that engine power, aerodynamic downforce/drag and tyres drive the performance of the car. Engine power is not really effected by any events that happen around them. As long as the engine receives fuel, air and electrical power, there will not be any random events. The only issues that can then effect the engine are failures, perhaps caused by errors such as cooling and ancillaries. Aerodynamics can be effected by other events. Again, other than failure of a part, the next biggest effect comes from other cars disturbing the air that the car travels through. The only other real effect comes from weather. High winds can also disturb the aerodynamics, in a similar way following another car. Tyres are probably one of the biggest changing factors in a race. They are highly non-linear. Their performance changes with a large number of variables making them very difficult to predict: track temperature/surface (which work to define grip)/condition (water! ), heat input (driver style, car downforce level, engine power, etc). Then there is the “software” element: the driver and the team! This is one the the largest areas for randomness. However, Formula One is the pinnacle of motorsports, so the level of skill is the best available, they don’t really make many mistakes (I realise this is a little controversial! ): not compared to many of the series that lead to F1. Teams in Formula One work very hard to reduce the risks in any of these events causing them problems. I think this is summed up in an interview with Ron Dennis in “Director” magazine (2009), ““When I came into motor racing so many things were a black art,” “But black art was a cloak for ‘we really don’t know’. It was intuitive engineering. I decided to make it a science. We will develop science to take away uncertainty to make winning a certainty”. This comment was reiterated when Martin Whitmarsh responded to criticism in Malaysia (2010), “The weather radar has been pretty reliable here. It predicted that it would pass through and we thought it would be dry by the end of the session. If you send a car out to do a banker, there is a risk”. McLaren focus’s on reducing uncertainty, sometimes it doesn’t pay off but you don’t notice the other 1,000 times that it delivers results. An interesting part of this focus on reducing uncertainty is that smaller teams can focus on these events to gain! When I ran Super Aguri F1 Team, this is exactly what we did. Probably the best example was in Canada in 2007 when Takuma Sato famously overtook Fernando Alonso. This occurred because we were able to switch onto a different, non-standard strategy in order to get onto the better tyre. McLaren had to follow their predetermined best strategy. Why? Because in general, changing strategy in the heat of battle does not deliver results. In general reducing risk, sticking to a plan and focusing delivers results. But it certainly makes for interesting racing! So at SAF1, we planned specifically for these events. Another interesting example is weather. At SAF1 we also knew that at a track like Bahrain, the weather would not vary much from year to year. In fact we would plot a chart showing the temperature over the previous 10 years, every hour, for the race weekend and 5 days past and previous: there were a number of tracks where nothing really happens year on year. With this level of statistical analysis applied to any variable that could provide a difference, it is easy to see how much effort is applied to reducing randomness! Bahrain (2010) – predictable weather, temperature within predicted range (hence engine cooling, tyre choice etc all within the expected “window”), predictable buildup to qualifying (all previous preparation on simulations and simulators within the expected “window”) resulted in the grid order fastest to slowest: as expected. Melbourne (2010) – unpredictable weather and temperature, unforgiving “walls” that punish small errors. In these circumstances it is easy to see that all of the preparation in the name of reducing uncertainty are thrown into chaos. With the race thrown into chaos, mistakes are made as the permutations and combinations increase the randomness of events. Is it possible to reduce the preparedness of the teams? Probably not. Only incredible reductions in funding could achieve this. With more people looking at more problems in more detail (specialisation), the understanding that Ron Dennis targets is achieved. It would be hard to go back to the “old days” when the team owner also drove the truck and the race engineer was also the chief mechanic! However, this is where some of the racing series such as Formula Fords, F3 and others are. This is some of the reasons that racing is often more exciting in these series. So how do we increase the chaos? Increasing the permutations and combinations of the event. Can we predict the results of a race? In Bahrain, following qualifying, yes, we can be fairly accurate. The permutations and combinations that feed into the teams race simulations are not too far wrong. Baring mistakes by the driver or the team and failures, the variables discussed above are dominant: tyres. How well the tyres performance is predicted is related to how well preparations are made on Friday testing and previous testing. Now that testing has been banned between races the focus has moved to simulators: but it does increase the chances of errors. This made me think of sports and games that have a large number of permutations and combinations. They are hard to predict. One thought I had was that games where the teams oppose each other, i.e. they have to go head to head. Like football or chess. The fact that the players clash when they pass through each others area on the way to the goal (or other winning area) results in a large number of possible interactions and hence permutations and combinations. Obviously in football, teams practice and practice formations and plays to reduce errors. In a game like chess, the number of possible different moves is constrained slightly by the squares on the board, but the theoretical number of outcomes is in the order of 10^27002 (http://answers.google.com/answers/threadview?id=389840) even though there is a maximum of 12,600 moves. First hypothesis: can we somehow introduce more ways in which the drivers interact more? What about artificial random events like pace cars, reverse grids, push to pass buttons and different racing lines? Pace cars have become acceptable in Formula One, but reverse grids are seen as too artificial. Bernie Ecclestone recently suggested having 5 chances to take different lines around the track to pass people they are stuck behind. Go karts often have a number of races where drivers line up in a number of separate races where they get different grid positions each race and receive points based on the number of cars they pass and positions in each race. These points add towards the final race where these points decide the final grid. Many chances for the cars to clash in order to provide different possible permutations and combinations for the final race. No real answers, but a look at many of the questions associated with randomness and how it effects the excitement of racing. What are the drivers performance in motor racing? In the absence of force, a body either is at rest or moves in a straight line with constant speed. A body experiencing a force F experiences an acceleration a related to F by F = ma, where m is the mass of the body. Alternatively, force is equal to the time derivative of momentum. Whenever a first body exerts a force F on a second body, the second body exerts a force −F on the first body. F and −F are equal in magnitude and opposite in direction. How do they relate to motor racing? Engine – the force that is transmitted to the wheels to accelerate the mass of the vehicle comes from the torque that is created. An equal and opposite force is reacted on the vehicle as it goes round a corner which comes from the grip of the tyres on the road. Mass, another important one, but most racing series stopped engineers reducing mass beyond a certain level long ago! Otherwise engineers would have kept going. So mass used to be a first order performance driver in most racing but was removed as a variable. Now it is part of the second order drivers of performance, not directly effecting a basic law of physics, but effecting things like dynamics and handling. In motorsports grip is associated with mu. Mu is proportional to a number of factors such as surface, tyre compound, temperature and load fluctuations just to name a few. What you will notice is that N is directly proportional to downforce and mu is proportional to the performance of the tyre. There is a lot of talk in the business press regarding innovation and how critical it is to western countries, keeping our lead in the world economy. Growth is driven by innovation and I thought it would be worth having a look at innovation in the context of motorsports. 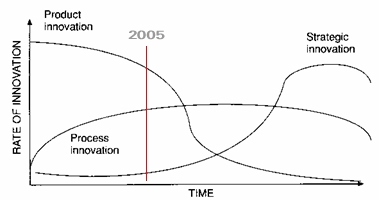 Below is a classic graphic showing the three phases of innovation: product, process and strategic. I hypothesize that F1 is in the final stages of the process innovation: hopefully to be followed by the strategic innovation stage, most likely driven by the economic crisis and the withdrawal of many of the automotive giants that have driven the process innovation that has characterised the last 10-15 years. So which era of Formula One characterised the product innovation stage? First it is worth noting what drivers performance in motor racing. First order drivers of performance come from the areas that most closely effect the basic laws of physics such as Newtons laws of motion. Initially innovation focussed on engines. Enzo Ferrari was one of the people who focussed most on engines and throughout his leadership of the company this is where the focus remained. It wasn’t until the 60’s when vehicle dynamics started to become seen as important with the move towards rearward engines. Without performing a large analysis on the subject his is most likely because of the changing engine efficiencies: smaller more efficient engines meant that they were no longer the dominant part of the vehicle from a weight and size point of view. The fact that aerodynamics and tyres required much more complex methods of understanding meant that they came a lot later in the innovation cycle. Aerodynamics was the next area that began to show promise with the introduction of wings. This brought with it a huge boom in innovation. Wings sprouted allover the place. To take this to extremes Gordan Murray even introduced a fan car that was created downforce directly proportional to the fan! Most innovations were banned or controlled but innovation keep moving on. Perhaps the next big area of innovation was active suspension. This innovation came when engineers realized that the car was also just one big wing with floors running so close to the ground they had become venturis. This innovation continued for a while but again it had to be controlled as the performance coming from these innovations was spiraling out of control! Then came the motor manufacturers. I mean the big ones, not Ferrari, which has always been what I would call a stand alone sports car manufacturer, even though is owned by Fiat. I think Fiat simply provides stability. The motor manufacturers I am talking about are the bigs ones: Honda, Toyota, Renault, Mercedes Benz, Ford and BMW. Only one remains when this blog was posted: Mercedes Benz. Their entry into the sport really started at the end of the 90’s when Ford began to take over Stewart Grand Prix. Renault followed in 2000, Honda took over Tyrell, Mercedes started investing in McLaren, Toyota started from scratch and BMW began to try to work closer with Williams. The car companies did a few things, one of which was to bring more rigor to F1: just look at how reliability increased over the last 10 years. I recently presented to a conference on carbon composites and showed a simple explanation of what happened when rigor is introduced into a sport. 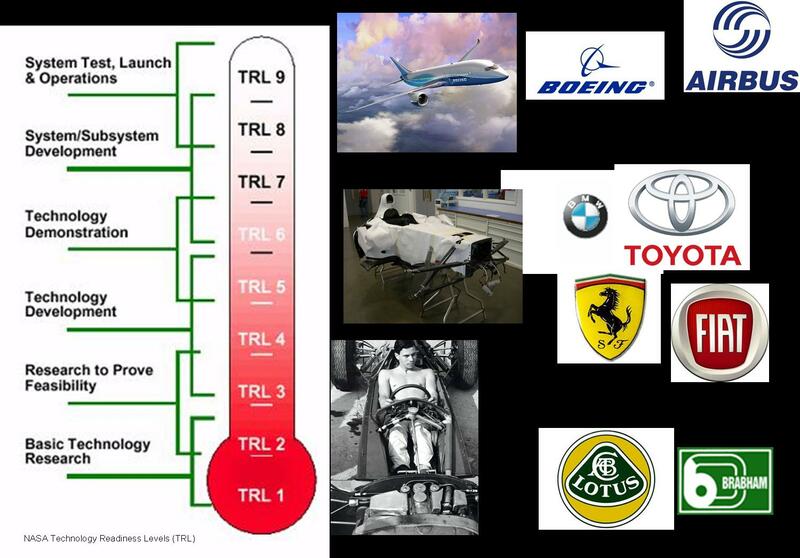 I found that NASA’s Technology Readiness Levels (TRL) were the best way of describing the changes that had happened in Formula One. The technology readiness levels are supposed to be used to describe new innovations and their stage in development: everything from Blue Sky research to developments that are fully ready for integration into mainstream commercial activities. The slide was used to compare motor racing to aerospace and most of the explanation came down to the differences in risk taking. This got me thinking about what effect the motor manufacturers (OEM’s) have had on the sport and I decided that part of it was the rigor that aerospace and OEM’s need for selling products. This got me thinking about process innovation as this rigor is mostly about better quality, more certainty and less risk. So the TRL graphic highlighted this fact, especially when compared to the old days of Lotus and Brabham! In F1 history, many of the engineers would come up with concepts at the track and they would be on the car in a matter of hours! This was real Blue Sky territory, albeit at the expense of rigor, which I believe then brought reliability. After a number of months of planning and fund raising, Oxford YASA Motors has received funding to spin-out of the Univeristy of Oxford. The initial project started with the Morgan LifeCar and has resulted in a new high torque density motor, very much suited to the new requirements of electric/hybrid vehicles. The author was part of the team that planned and pitched the business to a number of investors and finally secured the funding recently. There will doubtless be many new ideas that are generated off the back of this high torque density motors: perhaps with motorsports leading the way.